#OneThingThisMonth is where we challenge ourselves to complete just one goal that we set each month. Here’s a look at what we did last month (November) and our goal for next month (December). + Tanya – My goal in november was all about BLOGGING … plan out blog posts for December and January. Having even just the ideas planned out ahead of time puts less stress on me when it’s time to actually write out a blog post. And I was brainstorming ideas, I came up with the How We Get Inspiration For Blog Posts and Keep Our Creative Juices Going. So win, win on November’s #OneThingThisMonth. As we’ve mentioned before – we Use Evernote As A Blogging Editorial Calendar and we’re still doing so to this day. + Kim – My goal for November was to revamp my meal planning methods. Lately we’d begun to eat out a lot more and mostly because I wasn’t managing to get dinner on the table. I found that I was meal planning too many time consuming recipes, new-to-me recipes, and not enough tried and true favorites that take me less than 20 minutes to get on the table. So it was back to the basics. I actually made a list of about 30 favorite dinners and their variations. Then I drafted up a three month rotation system and it’s working brilliantly. We’re eating at home more, saving money, feeling healthier, and I’m enjoying cooking again. Back in June I wrote a Week in the Life [Dinner Edition] post. 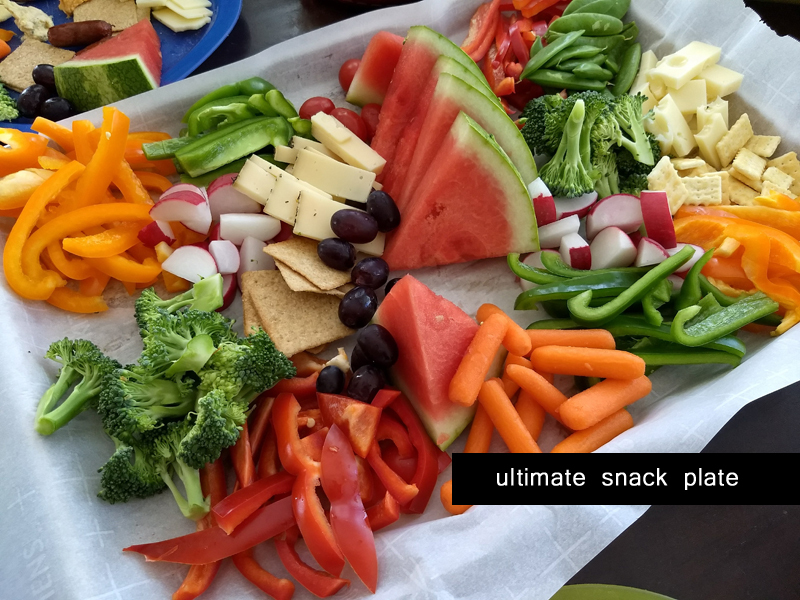 In that post I mentioned that I started doing Snack Plate Sundays. This is still in the plan and I love it so much. It’s such a great way to use up everything in your fridge at the end of the week, plus my kids think it’s fun to have ‘snackies’ for dinner. + Tanya – My goal for December is a pretty simple one – do everything for Christmas early! Christmas decorations go up before December 1st, no spending Christmas Eve in the stores shopping for presents, no wrapping of gifts the night before Christmas and no grocery shopping on Christmas Eve … and Christmas day! I’m hosting my parents + brother’s family this year – and I don’t think I can take the stress of last minute Christmas as is the norm around these parts. +Kim – I just want to…Have Christmas in Our Basement this year. 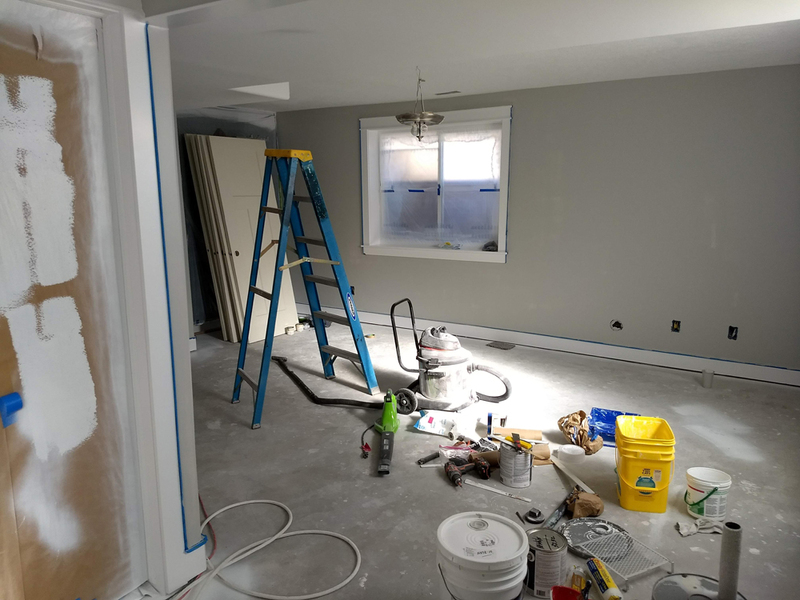 My husband has been working on finishing our basement for quite some time now. He’s doing all the work on his own late at night after the kids go to bed. It’s slow going but I’m so grateful that he has the skills to do it without having to hire any of it out (except carpet installation.) We are so close to it being done. We’ve been painting this week and the carpet will also go in this week. I’m hoping to have our family area all set up, decorated (including setting up the Christmas tree down there), and organized by the first of December. I’m so excited to have that space for my kids to play and for our family to hang out together in. What are your intentions for December? It’s so great that you do goal setting. Even just getting the idea down on paper (or on the blog) helps us to get it done. Good luck! I’d like to get all the Christmas stuff done before my daughter comes home from college so I can enjoy her time here and not be running around doing errands. I love this! Congrats to both of you on meeting your goals. My goal for December is to track my spending so I can be ready for my debt elimination in 2019. @Akilah – that’s an awesome goal. I plan on doing a better job at that next year. I’ve been working on a quick, easy, & few ingredient meal plan. I’m almost done. I always wait until the last minute to do my Christmas shopping. Bad, I know. @Vicki I love quick and easy meals. I can’t handle recipes with lots of ingredients and long prep times either.